But Facebook is really not that hard, and if done right, you have a lot to gain. By numbers alone, there are more people that regularly sign into Facebook than Twitter + Myspace + YouTube combined. It’s really important now more than ever to optimize your Facebook presence. EdgeRank is the name of the algorithm that Facebook uses to determine how often your content appears on a user’s news feed. This is key. Most of your fans don’t explicitly visit your artist page, so the only realistic chance of reaching them on Facebook is to appear on their respective news feeds. This is essentially what counts for “distribution” on Facebook. EdgeRank’ algorhithm determines what a user will see on their news feed. It attempts to filter out all the crap that gets shared on Facebook, and tries to predict what any given user will actually want to see. To any given fan, your musician/band page is competing with thousands of other friends, pages and other objects to grab their news feed real estate. So how does EdgeRank determine if your Facebook post is news feed worthy? One word: ENGAGEMENT. You need your fans to like, comment and share your Facebook posts. Anytime one of your fans engages with one of your posts, they’re more likely to see your following posts. Conversely, if a lot of your fans engage with your status update in the first few moments it’s posted, fans who sign into Facebook later are more likely to see it on their news feed. So early engagement on a post can be proportionately more important. There’s a lot of ways EdgeRank slices many factors that affect your news feed distribution. If you’d like to dive into the specifics of EdgeRank, google it and you’ll get a wealth of detailed articles, like this this, and this. No matter how facebook slices it, your actionable instruction remains the same: GET MORE ENGAGEMENT! Get those likes, those comments, those shares. Make it your main goal with Facebook. These engagement points build on top of itself, ensuring better and better distribution on news feeds over time as your engagement improves. It’s something like a credit score for your Facebook page, and the algorithm lends you more impressions the better you perform. Now that we’ve established the importance of getting good engagement on Facebook, let’s dive into art of actually doing it. Photos, Photos, Photos: Photos do well on facebook. Always consider a good and relevant image upload to accompany a status update. This one tactic alone can multiply your distribution, so be generous with the photo uploads. If possible, orient a photo in a square or portrait alignment (more engagement since it doesn’t get cropped in the news feed.) But don’t worry too much about it—a good landscape-oriented photo is better than no photo at all. Geo-targeting: Does it makes sense to geo target? 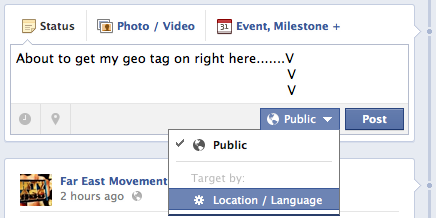 You can geo-target posts by city, state, provinces, or country. Geo-targeted posts usually reach a higher percentage of fans in the targeted location. Consider geo-targeting for tour dates, radio support, local appearances, etc. Tip:* Are you geo-targeting a post to an international country? Post in their language. Seriously, you will get a ridiculously good engagement % from this. Interact With Fans: Spend a few moments after posting interacting with fans who leave comments on your status update. Like their comments, and respond to them in your own comment box. As your fans see likes and comments coming from your page, they’re a lot more likely to leave a comment themselves, hoping that you might see their comment. And comments especially are EdgeRank gold! Plus, it’s an easy and quick way to make your fans’ day. Questions can work well. Try ending any given status update with a question that directly relates to your post. It can help jump start the commenting. Celebrate: Holidays are the ultimate zeitgeist moments; they are a great opportunity to engage with your fans. Put up holiday-themed posts on the day of, including unofficial ones like Valentines day, Mother’s/Father’s day, Halloween, etc. Say It With a Lyric: Are you a lyrical musician? Spell out your own lyrics in a status update, especially if it’s relevant to whatever else you’re pushing in the status update (links, videos, pics, etc.). Your lyrics are akin to a secret code language with your fans, especially if they’ve already emotionally connected with your words in song. Fans like that. Format lyrics to imply that they are indeed lyrics. And make it easy on the eyes, make it flow like the cadence of the song. The quicker the fan can recognize the lyrics, the quicker they will “like” the post. Milestones: Don’t forget to use Milestone posts for key moments from your life. Milestones are distributed wider, get more engagement, and are automatically expanded. You can created milestones in your timeline after-the-fact. 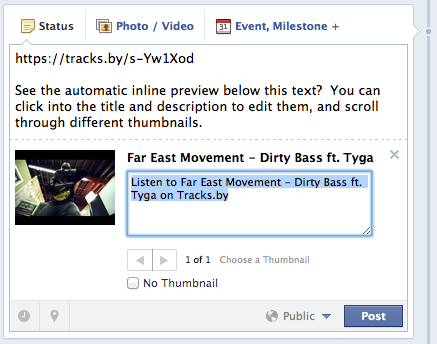 Tell a story of your career on Facebook: album releases, chart accomplishments, signing to management or labels, etc. Avoid Sloppy Auto-Posting Apps: Avoid auto-posting features, plug-ins and apps that don’t properly inline preview content to links: Tumblr, Twitter, etc. Exception: Instagram. One of the few auto-posting apps that properly auto-posts to FB, and gets good engagement. If you’re a frequent Twitterer, do NOT have Facebook auto-post your tweets. The Facebook audience and algorithm have less patience for frequent updates. And if fans start choosing to receive less updates from you (which they can do with one click), your EdgeRank will suffer. The Psychology of Click-throughs: Oftentimes your main objective in posting a given status update is to get click-throughs on a link. In this situation, you still want to write to maximize engagement because that gets you distribution. But you need to mind the goal of getting click-throughs as well. To that end, write a message that gives your fans a really good, direct reason to click through. Think like a fan, make them want it. Think of how the most trafficked bloggers use headlines to lure their audience to click through: oftentimes they’ll tease you into clicking through to the full article. They’ll appeal to your sense of surprise, novelty or exclusivity. For example, a lot of them use the tactic of priming your curiosity, holding back key info to compel you to click-through to satisfy your itch. I’ve re-hashed the above advice to countless artists and managers over the years, and oftentimes the last question they’ll ask me is what sort of engagement numbers they should be aiming for. That’s easy: better than what you were doing before! On a per status update basis, you should pay attention to all the obvious stats: likes, comments, shares, and impressions. You want to aim for better stats than what you’re used to seeing. Over longer periods of time, check your Insights and pay attention to the “Talking About This” graph. The “Talking About This” stat measures how many of your fans liked, commented or shared your posts - the exact raw materials needed to produce higher EdgeRank and distribution. Engagement can be unpredictable, so embrace that failure will happen. You might create the perfect post and still bomb. That’s okay, it’s a great opportunity to think through why it failed, and cognitively earn your way to your own conclusions. And last but not least, have fun with it! Strategic Facebooking doesn’t need to be a sinister machiavellian, manipulative, marketing scheme. Most of your fans actually want to hear from you and interact with you, and by employing the above tips, you are doing your part to reach them halfway. As an added bonus, Facebook gives you real-time feedback on how well your posts are performing. You’ll be surprised by the wisdom you gain into human psychology from observing your own FB engagement over time. Personally, I find it intellectually stimulating. Every status update is a creative, collaborative endeavor: put a little bit of yourself out there, and see how your fans respond.